Feeding the Fish brings your logo to life, creating one-of-a-kind performances that fuse tight choreography with specialised lighting effects. Feeding the Fish offer a range of shows to suit every event, venue and budget. A breathtaking spectacle of choreographed colour, their shows combine highly technical juggling, dance and cutting edge technology, and can include a logo or message in the finale. 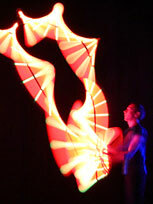 Founded in 1996, Feeding the Fish are creators of specialised juggling and light performances. Their shows can be seen at countless high-profile events including product launches, galas, sporting events, variety shows, festivals and awards ceremonies and to date they have performed in 51 countries. Feeding the Fish are the inventors of Pixel-Poi and Pixel Video Suits – sophisticated LED batons and tailored LED costumes - which can be programmed to reproduce a logo, brand or specialised graphic in light which creates a stunning effect. Since 2001, Feeding the Fish have designed and built the most advanced electronic juggling and performance equipment in the world and used this state of the art technology in their juggling and dance performances. The visual effects created by Feeding the Fish’s electronics are completely unique, and alongside the team’s world-class juggling performance, the technology is pivotal to the show. Extremely accurate sequencers and colour controllers are built into the equipment so that an entire show can be synchronised to the millisecond – morphing visual effects and colours alongside the juggling patterns, choreography and soundtrack. Flux: A breathtaking spectacle of choreographed colour that fuses highly technical juggling with dance and cutting edge technology. 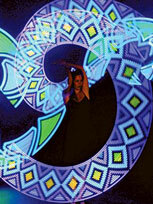 Kaleidoscope: Combining laser manipulation with lyrical and tightly choreographed dance, Kaleidoscope features Pixel -Poi® graphics and builds to a beautiful crescendo of colour. Supernova: An LED dance show that features sharp choreography and an eclectic soundtrack. 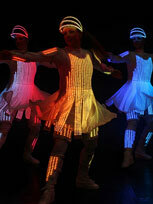 As the dancers perform, colours, words or logos are programmed to appear on their costumes. Zoom: Supernova - but on wheels. LED Hoverboard Glide About: Dancers zoom and greet your guests as their video sits seamlessly change from santa costumes, to elves, to falling snowflakes before your very eyes.